Patients can regain function and health of their teeth and gums with a full mouth reconstruction even if they have struggled long-term with their dental issues. A full mouth reconstruction combines restorative, neuromuscular, and cosmetic procedures, restoring the teeth, jaw, and gums. Not only addressing appearance, a full mouth reconstruction helps improve the structure and function of your mouth. The mouth contains soft and hard tissues; soft tissues include the gums, tongue, cheeks, and lips and hard tissues are the teeth and the jawbone. Connective tissues hold the structures of the mouth together, combined with nerves and blood vessels to help with feeling and function. 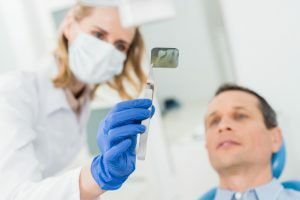 These tissues must work together properly for good oral health, and when several of them do not, it might be necessary to get a full mouth reconstruction. To determine if you are a candidate for full mouth reconstruction, contact us at our Fresno Dental Studio in CA to schedule an appointment by calling 559-297-1294 and learn more about what you need to achieve ideal oral health. What are the Treatments Involved with a Full Mouth Reconstruction? Depending on the state of your teeth, jaw, and gums, you might not need a full mouth reconstruction, and Dr. Denes might suggest another treatment to address your main concerns. If you have several oral health problems that affect most or all your teeth and the tissue systems in your mouth, you will likely be a good candidate for a full mouth reconstruction. You will need to discuss treatments and phases of a full mouth reconstruction further Dr. Denes. It is essential to talk about the timeframe and cost of care with Dr. Denes and what your insurance can cover during the consultation phase. As with any dental procedure, you will need to discuss your medical and dental history thoroughly with Dr. Denes, along with a current list of medications to ensure proper care and to prevent any issues. If you are a candidate for full mouth reconstruction, the planning phases for your case are critical to achieving optimal results. A full mouth reconstruction can take up to a year or longer to complete, depending on the treatments that you might need to restore structure and function to your teeth, jaw, and gums and the aesthetic goals that you wish to meet. Dr. Denes and our team at Fresno Dental Studio are ready to help you with your dental concerns. Please give us a call at 559-297-1294 to schedule an appointment.